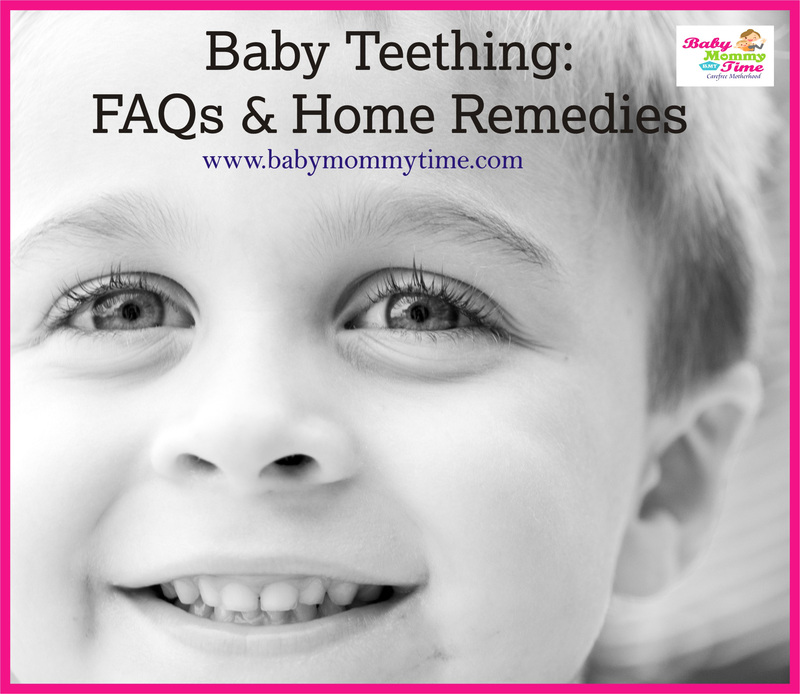 Baby Teething: FAQs & Home Remedies - Babymommytime - Top Blogs on Baby Care, Parenting Tips & Advice. Do you have all Knowledge about your Baby Teething Pattern. Many Parents don’t take this subject seriously, they think that Baby Teeth are god gifted part and it will automatically come up. That’s right, but there are few things which parents should not take it lightly. This is the worst time for your baby, they go through lots of pain and always feel uncomfortable. Here we are trying to give answer of all your queries and information related to your Baby’s Teething. Maybe your baby starts putting his fingers inside his mouth. You can see the tooth visible below the gum. Rubbing the cheeks & ears too much. Q1) When Will Baby First Tooth will come? A) Normally, babies’ first tooth erupts after baby turns 6 months old. And in very rare cases, it has seen that few babies get their first teeth around when they are 4 months old. Q2) Which Teeth Comes First? A) The bottom front two teeth of babies come up first and after that the top ones (they are called central incisors). After that baby side front teeth show up and it’s called as lateral incisors. Q3) For How many Days this Teething Pain will affect my Baby? A) Actually whenever new teeth start coming, babies start feel uncomfortable. This pain and uncomfortable period will take at least 6 to 7 days (one week). Q4) Till What Age Baby Full Teeth Come? A) Babies will get there full set of teeth by the age of 3 years. Q5) When does permanent teeth replace baby milk teeths? A) When child is 4 to 6 years old, till then baby permanent teeth won’t begin to replace the milk teeth of babies. Q6) What to do when Baby does not have any teeths by the age of one year old? A) There is no need to worry at all; in some cases it has been notice that baby’s first tooth come up when baby first birthday has been celebrated. There is no science and fundas behind it, just wait. Q7) When Parents need to see a child dentist? A) In case your baby does not have single teeth till he is two years old, then definitely there is some wrong. And parents also take the baby to child dentist. Or maybe you notice something wrong with your baby teeth pattern. Q8) Is pacifier effect the baby teeth? A) Normally, pacifier does not affect your baby teethes, if it is used in right way and for limited period. If you give the pacifier to your baby till he is 4 years old, then diffidently it will affect kid’s permanent teeth. Q9) Should I clean my baby few teeth? A) Yes, it’s important to clean baby teethes to avoid gum infection. And it gives more strength to baby’s teeth. Plus sooner your baby will adapt the cleaning part and start enjoying it. It will help you in future. Q10) Do you know the bottle feed can cause tooth decay? A) Many doctors advice, not to give babies milk in bottle at bedtime. It is the major reason behind the baby tooth decay. Currently, my children face this problem below the age of 3 years. Actually, what happened that baby’s teeth are left to expose with sugar liquid whole night and that’s why it affect baby’s teeth. Bottle at bedtime can cause the cavities and other dental problems. Therefore, it’s better to avoid the bedtime bottle feed. Q11) When do baby’s teeth fall out? A) Kids loss their baby teeth, when they are around 6 years old. The baby lower teeth are supposed to come first and fall out also first. This whole procedure will be complete by the kid turns 12 years old. Q12) When you can take your kid for first dental check up? A) There is no specify time or routine, whenever parents see or notice some unusually thing with your baby teethes, you can visit the dentist. Q13) How often does a parent need to take the baby for check up to child dentist? 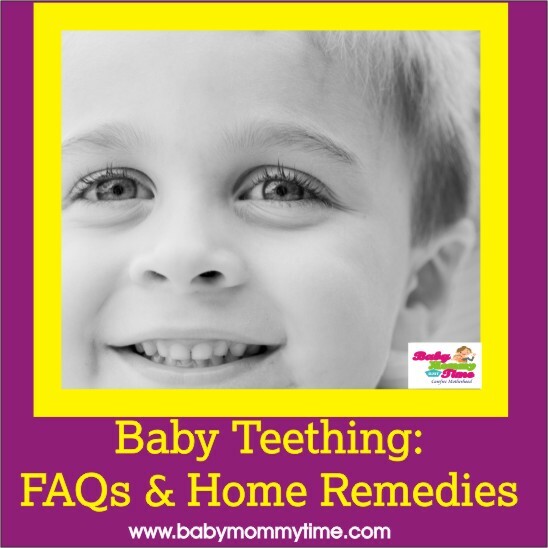 A) In every 6 months, in case you notice some dental problem in your baby teethes. 1# Breastfeeding: When baby has teething problem, the first thing they do is stopped taking food. At this time breastfeeding can play an important role, as maybe baby can refuse the bottle feed too. Try to give breastfeed to your baby more often. Breastfeeding will calm the baby and also help in filling the baby stomach. 2 # Extra Mother Love & Affection: At this stage your baby’s requires your extra attentions and love, as Babies cannot express their feelings and pain. It’s a parent’s duty to understand it and find the solution for baby. Try to always smooth your baby and give her extra love at the time. 3 # Chilled Teething Ring: Chilled teething rings are different from baby’s normal rings. You can easily keep this ring in your fridge for a while and after some time give the same chill ring to baby. Just make it sure that ring is not too chilled; otherwise baby will refuse to hold it. 4 # Homeopathic Medicine: Calcarea phosphoric is the best homeopathic medicine for babies. Babies love the taste of this medicine and they will ask for more. Many doctors say that any Homeopathic medicine will not work but there is no harm in trying it, as it contains calcium. Give at least 4 to 5 small sugar dose to your baby twice or thrice a day. It will be better if you start giving the medicine before teething pattern starts. 5 # Teething Ring: These days many brands are offering teething rings with filled water in many colours and styles. You can buy one of those teething rings and give to your baby. It will give him smooth feeling in his gums. 6 # Rub your baby gums: Give little bit pressure on baby’s gum by your fingers. Please remember that also clean your hand first before putting it in baby’s mouth, otherwise chance of infection increase. If possible keep this as your last options, as it’s not very hygiene. Instead of this Teething Rings are good options. Simply wanna input that you have a very decent web site, I like the design and style it actually stands out. I was just looking for this info for a while. After six hours of continuous Googleing, finally I got it in your site. I wonder what is the lack of Google strategy that don’t rank this type of informative web sites in top of the list. Usually the top sites are full of garbage.